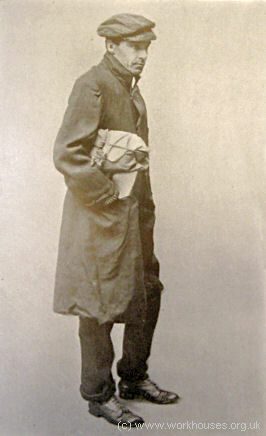 Denis Crane as a Dosser 'Denis Crane' was the pen-name of journalist Walter Thomas Cranfield. In 1910, he made a number of undercover excursions amongst London's poor, selling matches in the street, working as a porter at King's Cross railway station, and spending nights at a workhouse tramps' ward and in other types of shelter. His accounts of these adventures were published as A Vicarious Vagabond. In a respectable street not five miles from Charing Cross is a low, red-brick building of fairly recent construction, whose presence cannot be altogether welcome to the local residents nor increase the value of their property. The houses on either side are of decent size, and opposite are some that in a prosperous suburb would command a rent of fifty or sixty pounds but they have all seen better days, and probably not the best of them but has now a double or treble tenancy. The edifice stands back a few feet from the sidewalk, and is separated therefrom by iron railings of uncompromising rectitude. There are two entrances. Each comprises a long vestibule, furnished with a stout oaken seat down one side, and, at the far end, a door, also of solid proportions, with highly polished brass-work and a push-bell. Press the button and a stern official clangour immediately inside startles you into apprehension, and makes you repent your rashness. Such externally is the Blank Casual Ward, notorious among its patrons a few years ago as one of the strictest in the metropolis. If the distinction is now less marked it is because the discipline of the other wards has become severer rather than because its own has been relaxed. Notwithstanding the prevalence of distress, it is even on the coldest nights hardly ever full. It has accommodation for fifty men, but sometimes not more than five or six are admitted in a day, and the total muster at one time rarely exceeds a score. It was this reputation for severity that led me to select the Blank Ward from the many of its kind for my first experience of "the spike." As I stood in the vestibule, alone, and for a moment irresolute, at a quarter to nine one chilly night, a feeling of solitude and repugnance came over me not easy to master. "You are not quite yourself to-night," said a whisper, "put it off until to-morrow." Clearly there was but one way to thwart the impulse to retreat, and that was to make retreat impossible. Impetuously, therefore, I pushed the bell. The sound seemed to startle the city, and I expected a crowd to gather at the gate, but, turning, saw only an urchin's face, rudely staring. His gaping mouth stiffened into a grin as he caught my resentful gaze, and with a yell of derision he clattered away. As his footsteps died in the distance heavier ones approached from within, and a second later a keen-eyed official, in cap and tunic, was trying to read my soul. "Can you take me in?" stammered I. "Where did you sleep last night?" he demanded; and, getting a satisfactory answer, added, "You will be detained two nights and have a task of grinding corn to do." "Turn out your pockets on that seat, then, and tie the things up in your handkerchief." The door slammed, and again I was alone in the vestibule. A knife, a comb, a pipe, tobacco, a collar-stud, a pencil, a box of matches and three halfpennies did not take long to tie up, and I sat idly waiting for ten minutes or more. "Come along," at length was the stern command, with dictatorial gesture. Inside I found myself in a stone-paved passage, destitute of furniture save for a desk and a dozen little bundles like my own on the floor. The warder — such he was in style and function if not in name — went to the desk, and I put down my package with the rest. "Pick that up," he said sharply. "Don't do anything till you're told. . . . Any money in it?" "Now put your bundle down." A series of questions followed: What was my name, whence had I come, whither was I going, how old was I, what was my occupation, when was I last in a casual ward, and so on, the answers being recorded in a book. "Get back over there, and don't move until you're told." When he had done writing he ordered me to hold up my arms to be searched. In a pocket of my overcoat he came upon some loose matches. "What are these?" he demanded rudely. "Really, I didn't think them of sufficient importance to take out," I replied. "There are some more, I am afraid, in the other side." And I thrust in my hand in search of them. "You keep your hand out," he snapped; "I'll see to them." After a pause, I said, to shame him, "I'm sorry to give you so much trouble, but I am unfamiliar with the regulations." This softened him a little and he muttered churlishly, "It's no trouble, but you can't take matches inside." He then led the way into the day-room, a well-appointed chamber now dimly lighted and unoccupied, and, pointing to a seat, went out and locked the door. I observed that the two tables that ran lengthways down the room, and the high-backed forms, were white and spotless; that the table-cloths, though covered with crumbs as if after a meal, were equally clean; that the tesselated floor shone with much polishing; that the walls and woodwork were tastefully decorated and unsoiled; and that on one of the former the regulations of the establishment were conspicuously displayed. My satisfaction at the general cleanliness would have been considerably modified had I known that it was the work of relays of pauper slaves. Supper consisted of six ounces of coarse brown bread and a pint of "skilly." The latter, if what I had was a fair sample, is a much abused dish. It is simply oatmeal porridge just thin enough to be fluid. One can imagine what it would be if badly made or burnt, but in this case it was neither. Indeed, I have had worse porridge at good hotels. The chief objection to it is that, with the same quantity of bread, it is served at four of the five meals to which \ the casual is entitled, and after a sleepless night or a hard spell of work is a trifle more difficult to gulp down than a cup of tea or cocoa, and not quite so refreshing. The only meal at which any variation is made is dinner, which consists of eight ounces of bread, two of Dutch cheese, and water. I was lucky enough to get moist cheese; sometimes it is of the consistency of india-rubber. As I was finishing supper, there came in a tramp of the normal shaggy type, with filthy naked feet. We were the last two for the night. A dozen others had entered earlier, but had been two hours abed. When my unsavoury companion was ready, we were each conducted to a bath-room and told to strip. The baths were of porcelain, if I mistake not, and scrupulously clean, and the water was gratefully hot. The warder watched us bathing, but did not interfere. "Here's your shirt," he said, pointing to what looked like a piece of sacking. It was of dark brown canvas, picturesquely patched, ample in dimensions, and boasting but one button where there should have been four. As the garment struck rather chilly after the bath, I reached for my vest, but perceiving my intention he stopped me, saying that the shirt was all I was allowed to wear. He then told me to do my clothes up in a bundle and follow him. Now, the premises throughout are paved with concrete, and once off the draining-board the unfortunate casual, fresh from his hot bath, and attired only in his shirt, has to walk barefoot down a draughty corridor to his bed. This may chance to be near at hand, or it may be a considerable distance away. In either case he has to make the best of it. To hardy natures the ordeal is no doubt trivial, but to others it involves serious risk. Shivering and anxious, I followed my leader a dozen yards or so to an unlighted cubicle, the door of which was immediately closed upon me and locked. The sole illumination came through a grating over the door, and in the gloom I peered about for my bed. Imagine a brick chamber, four feet six inches wide by nine feet long, and nine or ten feet high, smaller and less comfortable than the first offender's prison cell, with a canvas hammock and two coarse rugs, but with not a mat nor a bit of boarding for the feet, and you have an idea of the sleeping accommodation provided by the modern metropolitan casual ward. It has the advantages of privacy, cleanliness, and ventilation — three unquestionable boons — but also the degradation of imprisonment and, in the winter, the misery of cold. The cells are supposed to be warmed by hot-water pipes, but the fire in the boiler was not even lighted when we went to bed on the second night, while the atmosphere on the first was not perceptibly warmer. When the glow from bathing had subsided I lay and shivered until dawn. If both rugs were on top, the cold struck up through the bottom of the hammock; if one were laid underneath, the top covering was inadequate. Either way the cold found you out. Nor was this discomfort entirely due to delicacy on my part. All night strong, hardy men tossed and cursed. We took a plebiscite at breakfast in the morning, and found that, thanks to the cold, only three men out of sixteen had been able to sleep. On the second evening, when we were allowed the use of a pillow, the occupant of the cell next to mine, who had recently been in the infirmary with pleurisy, tried to obtain a warmer covering by raiding a pile of spare rugs in one of the empty cells. Unfortunately, he was detected. He pleaded to be allowed to keep one, but was roughly refused. His rugs happened to be old and worn, so he asked leave at least to change them for thicker ones. This request, too, was denied. Then he begged to be allowed to wear some of his clothes, protesting that another night in the cold would send him to the infirmary again; but the warder was obdurate. Then might he dress and leave the ward? he asked; he would rather walk the streets than pass another night like the last. The request was urged with passionate entreaty, but was equally futile. Meanwhile, the other men, hearing the altercation, had crowded into the corridor. Perhaps this awakened some apprehension or some sense of shame in the warder's steely heart, for he gave way so far as to permit the wretched man to exchange one of his rugs for a thicker one. That, however, was the extent of his clemency. As I lay in my hammock after the indignity of searching, bullying and imprisonment, I fell a prey to morbid thoughts. The whole establishment, like a hideous incubus, seemed to press upon me. I could not shake off the conviction that I had committed some horrid crime and was awaiting trial or death. The shadow of the grille on the opposite wall recalled "The Ballad of Reading Gaol," and set me paraphrasing the stanzas to suit my case. But what a man must dread. At length I sprang up and shook myself — an effectual cure for hypochondria when the season is winter and the floor stone. The shock closured the versifying and recalled the realities of the situation. I determined to drain the cup of experience to the dregs — to ask no favour, plead no infirmity, shirk no task, but to do whatever might be required of me to the utmost of my power. With this sensible resolution, soon after the clocks outside had struck four, I fell asleep. The rattle of a key in the lock and the gruff tones of the jailer's voice awoke me at half-past five. The other prisoners were already astir. I joined them at the washbowls and beheld them a miscellaneous assortment of youth and age, vice and innocence. Some were "chewing the mop" (grumbling) about the scanty bedclothes; some animadverted in sulphurous and sanguinary terms on human life at large; others speculated on the prospects of the day; a small and wise minority held their peace. After breakfast, when the second-day's men had been discharged, the superintendent — an ex-army man not notable for tender mercy — called 4 the roll and assigned to us our tasks. He scrutinized me closely, and sent me with the three most degraded younger men to the corn mills. Half a dozen others were set oakum-picking, and the rest, old hands or men quite incapable of hard labour, cleaning the cubicles or patching shirts. The grinding and oakum-picking were done in a shed outside. Those deputed to the latter sat shivering on a form, endeavouring to console us who were at the mills with the assurance that, though laborious, our work would at least keep us warm. In that prophesied they truly. Warm we certainly were, and something over. Each grinder was located in a shallow stall, the most conspicuous object in which was an iron wheel, three feet in diameter, with a handle This wheel was connected with a mill on the other side of a partition. A small window enabled the officer in charge to keep the men under observation, and also enabled the toiler at the wheel to see how his work got on. I forget the quantity of corn each was required to grind, but it was considerable. In no case, however, was the full measure exacted, mainly, I believe, because there were other jobs to be done in the granary; but each man was kept busy, with an hour's interval for dinner, from eight till five. As luck would have it, I got the stiffest wheel of the four, and do not know what would have happened had the regulations been strictly enforced. After an hour and a half I was exhausted. Yet I had made little impression on the grain. Sitting down to gain my breath, I was startled by a sharp rap on the window. "Here, you," cried the officer, beckoning me to come round. When I reached him, "Go and get your coat," he ordered. My fellow labourers were curious. "What did he say?" they whispered, adding, when I told them, "He's going to put you on another job." As grinding was the hardest work in the establishment, I felt reassured. Out of the other men's hearing, the warder addressed me in milder tones, and instructed me to sweep three flights of stone steps, a work-room, a hall, the boiler-house, and two large cellars. This was a light duty, but it was supplemented by an order from the superintendent to scrub the same area with hot water. This to a novice, working on rough cement, was only less laborious than grinding. All the while I was at it this man kept interfering with superfluous instructions as to how the work should be done, and seemed disappointed when he could find no pretext for bullying. The only other interruption I had was a spell of work in the laundry, where I turned the wringer for the matron. I finished at two-thirty, having been on my knees for over three hours. An able-bodied labourer would have laughed at the job, but it taxed my strength to the utmost, and but for unlimited draughts of water (never was it more delicious) would have beaten me. Each time I filled my bucket at the hot-water tap I applied my lips to the cold. Ardently I hoped that all laborious and distressing duties were now over, but the superintendent's all-seeing eye fell on me, and he called me to the kitchen. Here I was promoted to the post of cook, having to stir the skilly over a roasting fire, from which it was impossible to get far away, owing to the size of the cauldron. The change of employment was probably a mark of confidence, for certain minor civilities were shown to me during the hour and a half that the duty lasted. When the porridge was done, at four o'clock, I was dismissed for the day, and dragging my tired limbs into the day-room, I sank on a form and fell fast asleep. An hour later tea was served, and at five-thirty we were ordered to bed. But I was now painfully awake, and continued so for over ten cold, restless hours. Soon after six on the following morning our belongings, including our half-pence, were returned to us, and we were free. Closely observing my fifteen fellow-prisoners during the hours we were thrown together, and listening to their conversation, I attempted to "place" them in the social and industrial scale. The majority were not "tramps" or wayfarers in the strict sense, but just homeless poor — more or less permanent residents of London, going from ward to ward, occasionally sleeping out, dropping into a charity shelter, or putting up at a cheap lodging-house, according to their means. That this was so was apparent from the hourly dread of some lest "old Buller" or "old Kitchener" — pet names of inspectors — should drop in and recognize them as having appeared at the same ward twice within a month, an offence punishable with prolonged detention. From the history of one man I was unsuccessful in trying to draw the veil, but of the others I learned that four were unskilled workers of various kinds, one was a journeyman tailor who had been in prison for theft, two were clerks, one a merchant seaman, one a ship's steward, still carrying his discharge, another a semi-imbecile, and the four others vagrants of the familiar type. Seven were well under forty years of age, and two were little more than thirty. One of the seven was an ex-artillery-man who had seen ten years of service in India and Burma. He was very bitter against "this country," which, said he, "takes the best years of a man's life and then he can go to hell." In this frame of mind he was in grave danger of demoralization from association with the tailor, who from time to time enlarged on the emoluments of crime. Burglary on a trivial scale, urged this gentleman, was "not worth the candle." You were more likely to get "crumpled" (caught); while the loot, generally poor in quality as well as quantity, was more difficult to dispose of. "If you can pull off a clear seventy or eighty pounds," he added reflectively, "you can do yourself a bit of good." This man was the only declared "bad" character of the party, and it is significant that to him was allotted the lightest task. Thus it would appear as if the real severities of this establishment are reserved, as in my own case, for the newcomer, for the man who is neither up nor down, "good" nor "bad." Most of the topics discussed in our idle moments were innocent enough, and were certainly wide of range. They extended from the General Election to the doctrine of reincarnation. Perhaps the most instructive conversation, in its way — and from the moralist's point of view surely one of the most hopeful — was on standards of morality. It arose out of the conviction of a clergyman of a repulsive crime, and led to some definite expressions of opinion on real and spurious Christianity. These men, though low in the world and themselves no better than they should be, still cherished high ethical ideals — for others — and murmured warm approval when one of their number remarked that, in the high court of heaven, it was the man who concealed his vice under a cloak of virtue who, above all others, would "get it middlin' thick." To one oft-recurring question my experience at Blank Street, as above detailed, furnishes an emphatic answer; the question why it is that the self-respecting casual, the honest man not yet gone under, shrinks from "the big 'ouse," preferring an Embankment seat or the rheumatic hospitality of an arch. The penal conditions, intended for the professional vagrant, whom they only drive away, fall with mischievous severity on the respectable out-of-work, who goes into the casual ward a man and comes out something less. In all that matters — health, character, capacity — he is the equal of the warder who bullies him; the sole distinction, it may be, is his homelessness, a misfortune which, whatever its cause, has some claim to consideration; yet he is treated as a felon, and this notwithstanding that, by a hard day's work, worth in the open market from three to five shillings at the least, he pays for all and more than all he has. We talk of "sweating" down East and in philanthropic workshops whose sole aim is the reclamation of the lost, but here surely is sweating of the most flagrant and demoralizing kind in the State itself. Little wonder, then, that the poor regard the workhouse with repugnance. Were not this limb of our Poor Law machinery so ghastly, so mischievous, in its inutility, it would be supremely absurd. While it lasts, however, comparatively happy is the victim who can ignore the mischief and chuckle at the folly: "Let us take what we get and be thankful. What right have we poor devils to be nice?"